When I was at The Log Cabin patchwork shop in Germany with Marijke and Renee last year, I 'liked' and bought half a metre of this colourful fabric that was for making a bag. I, as usual, didn't really know what to use it for and had no plan for it. 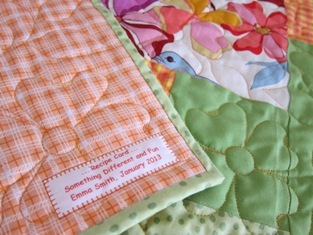 Just happened that, one night, I came across a picture of this particular quilt named 'Recipe Cards' in a catalogue from Keepsake Quilting (I'm one of the shop's on-line customers). 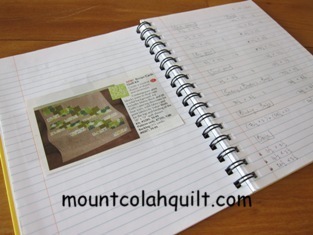 I, then, started to calculate and scribble the measurements of the fabrics for the quilt in my notebook, working backward from the finished quilt size given. It's my 'relaxation' after work, and suddenly, there was a purpose for the piece of fabric from the trip. :-) At the same time, this would allow me to 'indulge' my love of sunny orange colour. Perfect.! ....Although the piecing wasn't difficult, I had to unpick a few sections when I wasn't checking the directions of the pieces with the pattern while sewing them together. 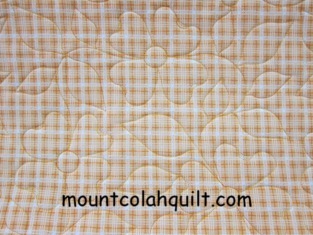 The background fabric was soft and easily stretched as I don't normally use spray starch on my quilt tops. 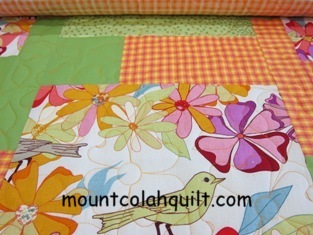 So, it was a good opportunity to 'float' the quilt top when quilting it on my wonderful Gammill Statler Stitcher. 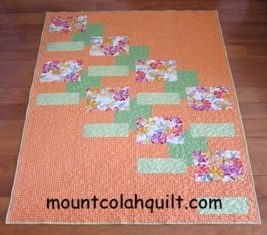 The quilted quilt was (and is) beautiful, and I had none of the problems anticipated even though it's the first time I utilised the technique. To match the feature fabric on the quilt top, I decided on the quilting pattern named '2394 Dogwood Flower E2E' by Tammy Finkler. Looks good Emma. I'm glad someone else likes designing. I do too, but so many people only ever copy a pattern from a magazine or book. Hmmm.... There are choice and preferences, I think. And fortunately, even better, there isn't absolute right or wrong. :-) Hope your blog is coming along well, Susan.